A birthday makes you feel special with everyone dancing and singing for you. The birthday song that is customized and sung by family and friends makes for a sweet little wishing song for your little angel. This coloring page shows the happiness on not only the birthday boy’s face but also on faces of his friends as they sing the birthday song for him. This coloring page is also a great way you can get your little one to learn the words of the birthday song. This picture is a scene from a family birthday celebration. It is not exactly a birthday party but a close family gathering. We see the birthday boy blowing the candle on the cake, with his brother on his side singing the birthday song for him. Even the pet dog has climbed up on the table to take part in the joyous birthday celebration. On the background we see balloons and stars, the birthday symbols. The most important part of getting your child to take active interest in art and paint is to encourage their talent by appreciating everything they do and help them take their art to the next level. 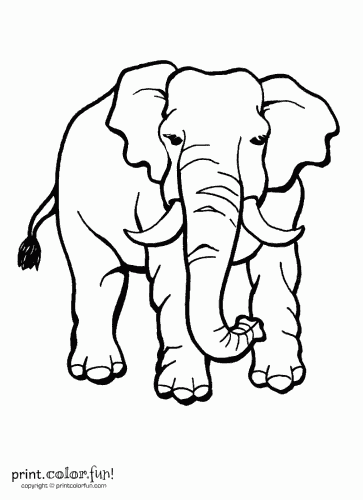 Let you kid play around with these coloring pages and watch his imagination take new shape. Kitty is a favorite animal cartoon character of all little children, especially little girls love kitty. Then want kitty on their dinner plates and school bags too. This coloring page showing Kitty dressed as a princess is suitable for your own little prince or princess. Who doesn’t like birthday parties! Well, not only kids but adults enjoy birthday parties! Here is a fun coloring page for kids to color, portraying a birthday party of a 5 year old with the entire family. This would make a great idea for a greeting card for your kid’s sibling who is turning 5. This is an interesting coloring page, and also an unusual birthday card. Guide your little one to color this birthday certificate for his or her dear grandma. It is a great way to thank her for the yummy cakes she makes for everyone at home and the interesting bedtime stories. See, how this cute little teddy wearing a bow brings in the birthday gift. All children possess soft toys, which are decorated on his bed. One of the soft toys is a teddy bear. This picture will spark his imagination and he will imagine his favorite teddy bear, which he cuddles while sleeping is also bringing him a gift for his birthday. Children and adults both love cupcakes and even more if it is made of chocolate! Let your child’s imagination run wild when he colors the icing. If you happen to be the child’s teacher, giving your student a coloring page to do. You can suggest him to color this page and gift it to his mother on her birthday. Your child will instantly connect with this picture and will love coloring this page. It is a great way to show love for pets too! Pets are like family friends and they have emotions as well. To all mothers, don’t forget to pin up this card in your room; it is the best way to show your appreciation for his innocent little gift. Does your child demand a personalized cake for his birthday with only those colors that he likes? Here is a coloring page of a birthday cake that your kid can color based on his fantasy. You can help your kid to color this cake. Some choices are using rainbow colors for a rainbow cake, red and white for a red velvet cake or just brown for his favorite chocolate cake. Color the candles using bright colors to create the perfect picture. This cake can also be cut out for the birthday collage that you and your kid are doing up for daddy’s surprise birthday party! Just see the happy looking dinosaur carrying the birthday cake on his back. If you have two children, and if your elder child is about to turn seven years old, you can encourage your younger one to make a card for his sibling. It is very important to foster a healthy relationship between siblings, one that is full of affection and respect. 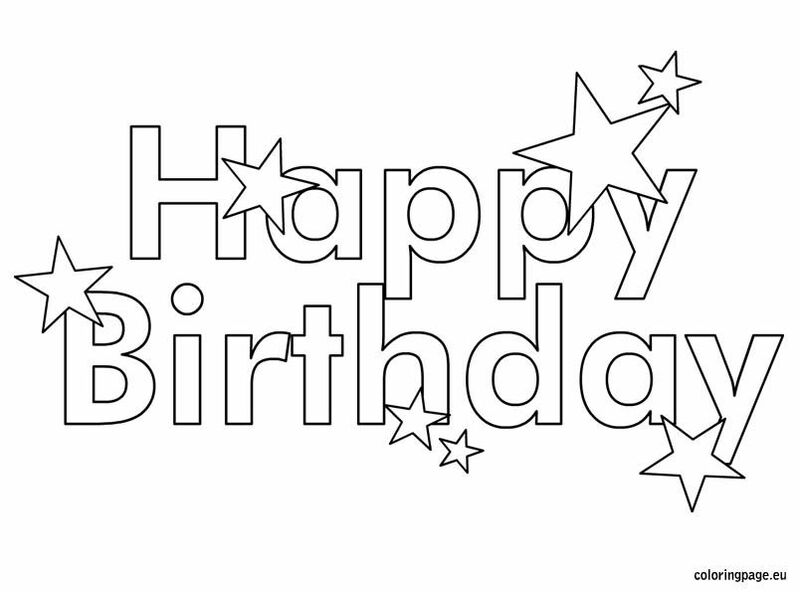 Here is a coloring page of a happy birthday boy for your kid to color and have fun with. Watch your kid warm up his imagination as he colors this page, pretty much imagining himself or his friend in his birthday dress. If you are arranging a birthday party for your little son or daughter then you can get your child to color the invitation card. Guide him or her as he colors the invitation card and write the details. Everyone who receives this invitation card will appreciate your kid’s talent and handwriting. This princess invitation card will get the personal touch. 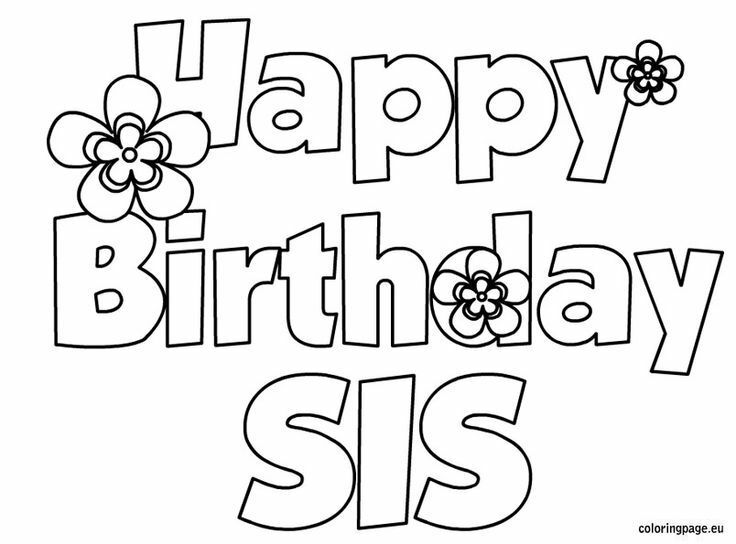 Birthday coloring pages for kids – in this category you can find best drawings for birthday party. Every time when birthday coming – we start to prepare for birthday party and trying to find coloring pages for our kids. Because the best birthday gift from kids is colored coloring page. Our kids cant buy gifts. They can do gifts only by his hands. If kids can draw birthday picture – it is cool. But someone prefers to print coloring pages and color it. I think coloring pages makes double benefit – your kids make gift by itself and learn to color, feel colors, accept boundaries and develop imagination. Here we have ready templates of printable birthday invitations, picures with birthday cackes for every age. You can find birthday party coloring pages for 1, 2, 3, 4, 5 years. P.S. Happy birthday! Flowers make great birthday gifts. Both children and adults like flowers, especially girls love flowers more than boys. There is something delicate and feminine about flowers that make it a girl’s favorite. Gift your child a bouquet of flowers and see how happy she is. You can also give this coloring page to your child and ask her to color the roses. Roses are every girl’s favorite flower. Each color of rose stands for a virtue. For instance, red rose stands for love, white rose stands for peace and yellow for friendship. All these virtues are so important in making your child a good human being. Help your child to color this page; this can be an excellent greeting card for his nana’s birthday. A homemade greeting card has a personal touch to it and is much more appreciated than a commercial greeting card. After all it is emotion of love and respect that matters more. The person receiving it will be happy and feel special, when he finds that his little grandchild has made the greeting card on his own. Birthday party is incomplete without some bright colored, glittering and cute party caps that kids almost fight for. This coloring page allows your kid to color party caps the way he wants and imagines. Just let him use some bright colors and glitters to make the caps really attractive. This one is a must to go up on the birthday collage that you and your child will be creating! This coloring page has two fold purposes, one your child will enjoy coloring the dinosaur and the cake, and also this page can serve as a greeting card for his brother or sister. A birthday is incomplete with a birthday wish and a cake. Children love when everyone wishes his happy birthday and makes him feel special. Little children love to be the center of attention and want everybody’s affection. You can pin up this coloring page in your kid’s room. Notice his excitement while he colors Mickey Mouse and the balloons! Candies, chocolates, cakes and lollipops are children’s favorite foods. They might be fussy eaters, but give them a lollipop and you won’t hear a single complain! In this picture we see a tin full of lollipops with the happy birthday message on them. Mickey Mouse is a funny animal cartoon character and the official mascot of the Walt Disney Company. Your child will definitely love coloring this picture of Mickey Mouse holding on to a cut out and wishing happy birthday. It will remind him of the amazing adventures of Mickey Mouse and his friends. Birthdays hold great importance and excitement not only for kids but for adults too. Kids are really excited to celebrate their and their loved ones’ birthdays, as for them it means cakes, chocolates, games, parties, fun and lot of celebration. See who is wishing happy birthday, a mischievous looking monster!This monster has polka dots on his body. He is jutting his tongue out, just like your little one, when some naughty idea is cooking in his mind. He is wearing a party hat and holding on to a heart shaped cup cake with one lighted candle on it. If your child is about to turn one year old, this is a suitable birthday coloring page for him. This will evoke some excitement and suspense in your child, he will think about the gifts he will get on his birthday! Since for children, birthday is synonymous with gifts. What is a kid’s birthday party without fun masks adorning young faces? This great clown mask can be a great coloring page for your kid to try different color combinations to paint the clown. It’s a clown after all, so just let your child color the way he wants. Once the coloring page is done you can even cut out the clown mask, stick it up on a thick chart paper, punch holes at both sides and run an elastic string through the holes. An actual clown mask for your child! In this picture we see the cute little Tweety wearing a party hat and sitting on a birthday cake. Your child will have a great time coloring the candles, party hat and will cake look even more delicious. As a parent you will be able to gauge his cognitive development and his creative thinking when your child colors the picture. Your little one will remember his birthday party or his friend’s birthday party when coloring this page. A great way to bring the joys of birthday into some every day activity is by giving them some happy birthday pages to color. Happy birthday color pages are a great way to let your kid experiment with different designs and images. They help him create his own birthday greeting cards for family and friends. Your child will color the roses using her favorite color, notice which color she uses. You can give her the same color roses on her next birthday or if she achieves something great. Always appreciate her for her achievements; this will make her a confident person in the long run. Here are our top 35 picks for great happy birthday coloring pages for that perfect birthday card, straight from your child to you! For every child, a mother holds the most important place in his or her life. Each child feels his mommy dearest is the best mommy in the world! That’s so true, so nothing can be better than to surprise his mother with this coloring page on her birthday. Print this coloring page for your kid to color these gift boxes. Boxes of different shapes, sizes, with ribbons and pretty colors make every kid’s birthday even more special. A fun idea would be to get your kid to color this page before his birthday party and as he colors each gift box ask to secretly write what each gift box should contain. Imagine the look on your child’s face when he opens his actual gifts and finds exactly what he had wished for in his coloring page. Now that is a real surprise party! You can stick up a cute picture of your kid in the empty space. When we say birthday party, what’s the first thing that comes to your mind? Obviously colorful balloons and streamers! So here is an apt coloring page that your kid can color, using his favorite colors. To make this coloring page more fun, get some metallic paints and see how beautiful this coloring page turns out. Today coloring pages:Little astronaut in a space – Coloring page for kids Dinosaur train collection coloring page for kids, printable free. Sheet 1 Duck tales Indians coloring pages for kids, printable free Masha and Bear apple coloring pages for kids printable free Rugrats kids coloring pages for kids, printable free – Rugrats cartoon Flintstones kids coloring pages for kids, printable free – Flintstones The Сat in the hat and the big jellyfish coloring pages for kids, printable free – Dr. Observe what color he adds to the spots on the dinosaur’s body. You can guide him when your child colors the cake and the number 7. Isn’t it a great idea to make the coloring page an interesting greeting card? Children loves gifts, to them birthday means delicious food and gifts. They wait for their birthday every way to get the gift he wishes secretly. How excited do they feel when they see, they got what they wished for! This is a modern way of saying happy birthday. What if you forgot your friend’s birthday and remember it last minute! Best way to give him a birthday cupcake with a candle on it. It is a symbolic representation of birthday. These coloring pages will be great aids to help your child learn craft with colors. It is also a great way to let them enjoy something else other than getting hooked on to gadgets! This teddy is as cute and adorable as your child. He will simply enjoy coloring this teddy bear. As parents it is important to know what your child wants, you can ask him to put his wishes on a paper and place it inside a sock and hang it on top of the bed, just like he does for Santa Claus. You can also check his expression when is seeing an advertisement of a children’s toy on television. Sometimes you don’t need to work hard to know what they want; the child might ask you directly for a gift. Promise his one for his birthday or as a reward for his little achievements at his play school. A great one for your child’s birthday greeting. Get your kid to color these numbered candle images with bright metallic colors. If you have some plain colors use them and sprinkle some gold or diamond dust to give them a magical touch. You can even cut out the number that symbolizes your kid’s age and stick it on your kid’s birthday greeting card. If he has seen the cartoon, where Tweety escapes from the clutches of the naughty cat, then he will love coloring this page even more. Notice how your child colors each lollipop with different colors. You can use this as a poster and decorate your house during your child’s birthday party. 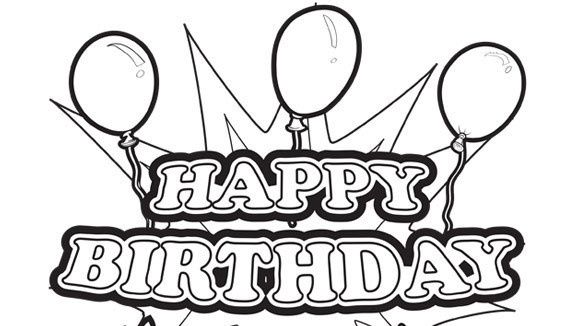 This coloring page is full of adorable characters and colorful balloons. It is a lot of fun to create for your kids. 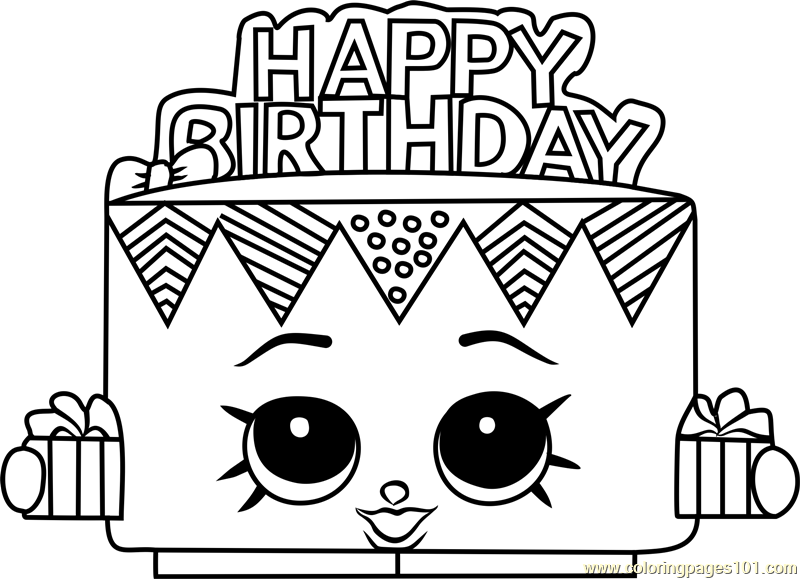 This coloring page contains adorable friends, birthday cake, birthday presents and a greeting card. To make it more interesting you can get your kid to cut out his picture and paste it here too. Your child will also enjoy coloring the cupcakes and the heart shaped decorations on the icing.Hearts depict love, nothing can be better than a greeting card to express your affection! Many kids love to dress as prince and princess too, so just notice the broad grin on their face when they see this kitty coloring page. They will enjoy the fun activity even more when you share your knowledge about the cartoon character of Kitty. You can also help your child to research on the kitty’s character once your child finishes coloring the page. Don’t forget to pin it up in his room! It is important to teach your child to respect elders, especially grandparents and appreciate their concern. Only parents can teach their children to love and respect their grandparents. 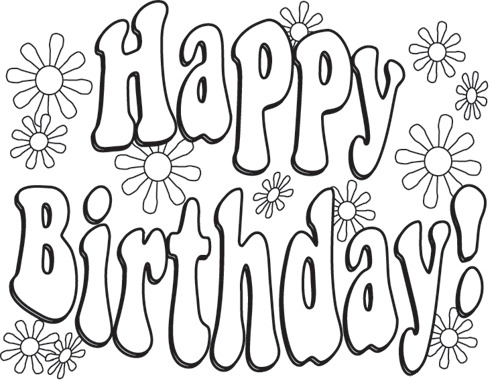 This coloring page can serve as an excellent card for grandma’s upcoming birthday. The out of the box idea to give a birthday certificate rather than a card is also interesting!